After a large mid-day brunch or afternoon of football, wings, and beer, I often find myself in a conundrum come dinnertime on Sunday. When we’re feeling on top of our game, we use Sunday nights to leisurely prepare food for the week and to make a proper Sunday dinner, with sports on in the background, of course. But more often than not, we’re too tired too cook, or still full from brunch. 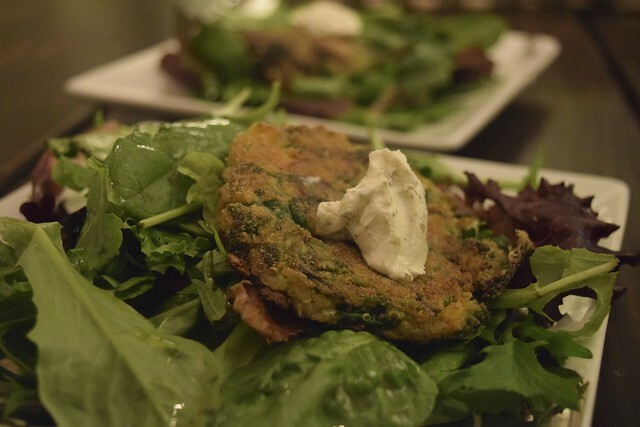 For those nights that we don’t necessarily have a ton of energy to prepare dinner, but want to eat something healthy and simple I turn to these quinoa spinach cakes, which are a simple, healthy vegetarian meal. These cakes can be served alone or with a fried egg. Or, on top of a simple mixed green salad with sliced pears and a dollop of goat cheese. *Note: this recipe needs to be frozen for at least 4 hours or overnight. In a small saucepan, combine the quinoa with 1 cup of water and bring to a boil. Cover and cook over low heat until the water has been absorbed, about 15 minutes. Meanwhile, in a large skillet, heat 1 tablespoon of the olive oil. Add the shallot and cook over moderate heat, stirring, until softened, about 1 minute. Add the spinach and cook until most of the liquid has evaporated, about 5 minutes. Season with salt and pepper. Transfer the spinach to a strainer and let cool slightly; press out any remaining liquid and finely chop the spinach. In a large saucepan, combine the milk, 1 1/2 cups of water, 1 tablespoon of the olive oil and 2 teaspoons of salt and bring to a boil. Remove the pan from the heat and gradually whisk in the semolina until very smooth. Cook over moderate heat, stirring constantly with a wooden spoon, until the semolina is thick enough to hold soft peaks when the spoon is lifted, about 7 minutes. Remove the semolina from the heat and stir in the quinoa and Parmigiano. Season with salt and pepper and let cool for 15 minutes. Stir the beaten whole egg and spinach into the quinoa mixture and spread in an ungreased 7-by-11-inch pan; it will be about 2 inches thick. Let cool at room temperature, then cover loosely with plastic wrap and refrigerate for at least 4 hours or overnight. Preheat the oven to 250°. Cut the chilled semolina mixture into 12 squares. Put the panko in a shallow dish and season with 1 teaspoon of salt. In another shallow dish, whisk the egg whites with 1/2 teaspoon of salt and 1 tablespoon of water. Dip the cakes into the whites and turn to coat, letting the excess drip off. Coat the cakes in the panko and shake off excess crumbs. In a large skillet, heat 2 tablespoons of the olive oil. Add half of the cakes and cook over moderately high heat until golden on both sides and on the edges, about 6 minutes; adjust the heat as necessary to prevent the cakes from burning. Drain the cakes on a paper towel–lined plate, and serve on top of mixed greens. Add a dollop of goat cheese and salt/pepper to taste. Enjoy!